English: Hihi; French: Méliphage hihi; German: Hihi; Spanish: Pájaro Puntado. 7 in (18 cm); female 1.1 oz (30 g), male 1.3 oz (36 g). Dark head, throat, and upperparts with white patch behind eye. 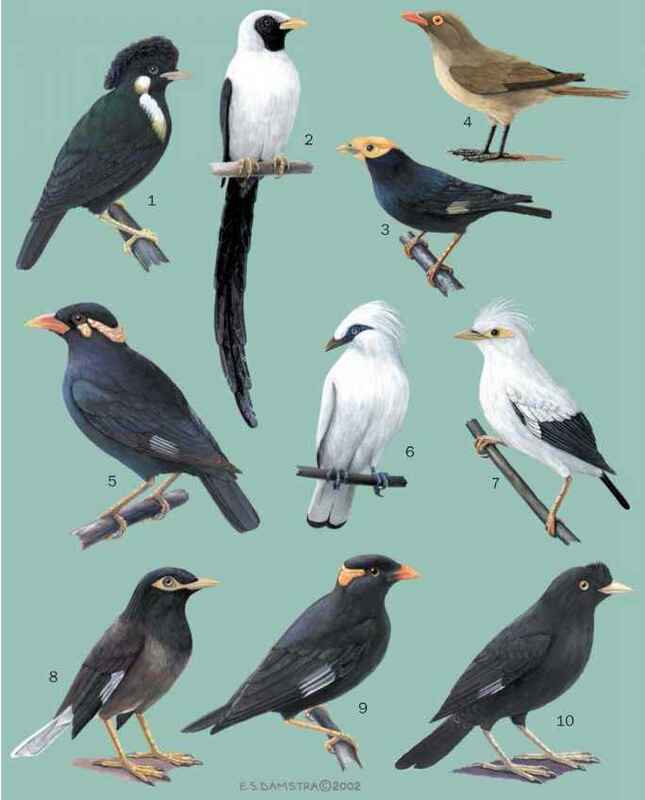 Yellow breast with white belly; wings black with yellow and white tips. Once widespread on North Island, but the only natural population is on Little Barrier Island. They have been introduced to several other islands, including Hen, Cuvier, Kapiti, and Tiritiri Matingi off North Island and Mokoia Island in Lake Rotorua. Warm temperate rainforest, especially in gullies. In pairs in breeding season and small groups at other times. Male has an aggressive display with tail and ear-tufts raised and showing off golden shoulders. Although pairs usually mate in the conventional manner, males sometimes force the female to copulate by holding her on her back on the ground. Such males are typically not the partner, and this method of copulating is apparently unique among birds. High-pitched contact calls, males give a loud whistling song. Roost in cavities. Insects are taken by gleaning and sallying. Forage extensively on nectar and fruit of a wide variety of trees and shrubs, with proportions varying seasonally. Breed as monogamous pairs but with frequent extra-pair copulations. Exceptional among honeyeaters in nesting in hollows of dead or living trees. Will use nesting boxes on islands with insufficient natural hollows. Complex nest built of sticks, fern rhizomes, and rootlets. The nest is mostly built by female (occasionally more than one), but male may also collect sticks. Two to five eggs are incubated solely by female for about 16 days. Young are fed by both parents and fledge at 26-32 days (an exceptionally long period for a honeyeater). Young join a creche one week after fledging and are not fed by their parents. Vulnerable, with population of about 5,000 on Little Barrier Island. Populations reestablished on other islands remain small and precarious. Previous threats included over-collection, loss of nesting hollows, and introduced predators such as black rats (Rattus rattus).